Hi! 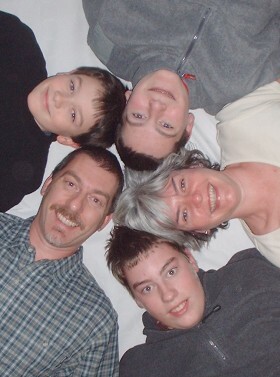 my name is Stephen March and along with my wife Sharon and our three sons Benjamin (15), Joshua (13) and Caleb (11) we are currently in Villy en Auxois in France developing our French language skills and looking to see what 'shape' God wants our lives here to have. Sharon and I met as children when my father went to be the pastor of Kilsyth Congregational Church, an Independent Congregational church which her family attended in Kilsyth, a small town 13 miles Northeast of Glasgow, Scotland. We had a fairly normal upbringing. As Protestant, Evangelicals both our families were very committed to their faith and the church community was the central focus of our families lives. All our parents were very involved with serving in the church - obviously mine were as my father was the Pastor! But Sharon's dad was also a deacon and lay-preacher and her mum the Captain of the Girl's Brigade. As children both Sharon and I made a commitment to Christ and were encouraged in, modelled and taught the Christian faith in our homes. As adults we embarked upon our respective professional careers - Sharon as a French teacher in Secondary Schools, me as a Radiocommunications Engineer working within the Civil Service. Eventually our stars crossed and we became "romantically linked" and got married in 1986.